Welcome to the November edition of the Daring Bakers! This month's challenge was hosted by the hilarious and talented Lisa Michele of Parsley, Sage, Desserts, and Line Drives. Lisa Michele took us outside the box (or should I say the oven?!) this month by asking the Daring Bakers not to bake! Instead, she had us face our deep-frying fears to make cannoli, a technique that was certainly new to me. Since I had some technical difficulties with the cannoli forms (pretty sure my dough wasn't rolled quite thin enough, it unfolded off the forms in the oil), I made a few different versions: some traditionally-shaped cannoli, plus a few open faced ones (below), and a bunch of "canapes": cannoli chips with a dollop of filling on top. I thought long and hard about a fun twist or flavor inspiration in the true Daring Baker spirit, but wound up choosing to do the simplest, plainest preparation possible. I even omitted the chocolate chunks and pistachios that the filling recipe called for. In the end, I'm really happy with that choice. 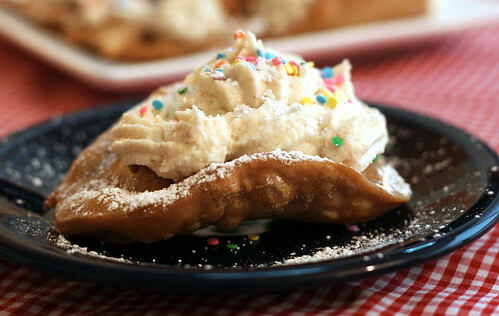 The filling was melt-in-your-mouth flavorful on its own, and I brightened the pastries up with some fun colored sprinkles and a dusting of powdered sugar. I loved these (as did all the friends and family who happily taste-tested them for me). I had a lot of fun making them and conquering my fear of hot oil, but I don't know if I see a lot of deep frying in my future. It's one of those techniques that, on the rare occasion I want to treat myself with something fried, I think I'll leave to the pros. Thanks to Lisa Michele for introducing us to something totally new and different this month, and being a patient and generous hostess. 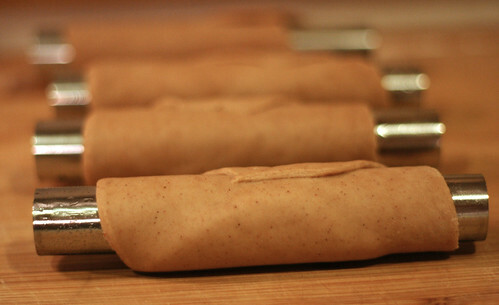 For the cannoli recipe, tips, and to see what my fellow Daring Bakers came up with this month, please pop over to The Daring Kitchenhttp://thedaringkitchen.com/recipe/cannoli! Blog-checking fine print: The November 2009 Daring Bakers Challenge was chosen and hosted by Lisa Michele of Parsley, Sage, Desserts and Line Drives. She chose the Italian Pastry, Cannolo (Cannoli is plural), using the cookbooks Lidia’s Italian-American Kitchen by Lidia Matticchio Bastianich and The Sopranos Family Cookbook by Allen Rucker; recipes by Michelle Scicolone, as ingredient/direction guides. She added her own modifications/changes, so the recipe is not 100% verbatim from either book. They look fantastic Amy! Love the sprinkles - too cute! I skipped the chocolate chunks and pistachios in the filling too! 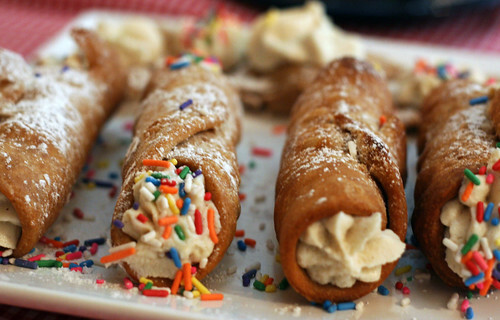 I'm glad your conquered your fear of frying - your cannoli look fantastic! LOVE LOVE LOVE them they look so delicious and the colours are fabulous well done. Cheers from Audax in Australia. Love the colorful little sprinkles. Wow, Amy!! I am SOOO impressed! Canolinis are not easy and yours look fantastic!! I love the rainbow sprinkles on top - the perfect finishing touch! What great little confections. Love the sprinkles. They look so festive.